Here’s my take on The Twilight Saga: Eclipse Official Motion Picture Soundtrack (Deluxe Edition) and all of the amazing songs that have been written for the forthcoming Eclipse movie! This is the perfect opener for the Eclipse soundtrack. 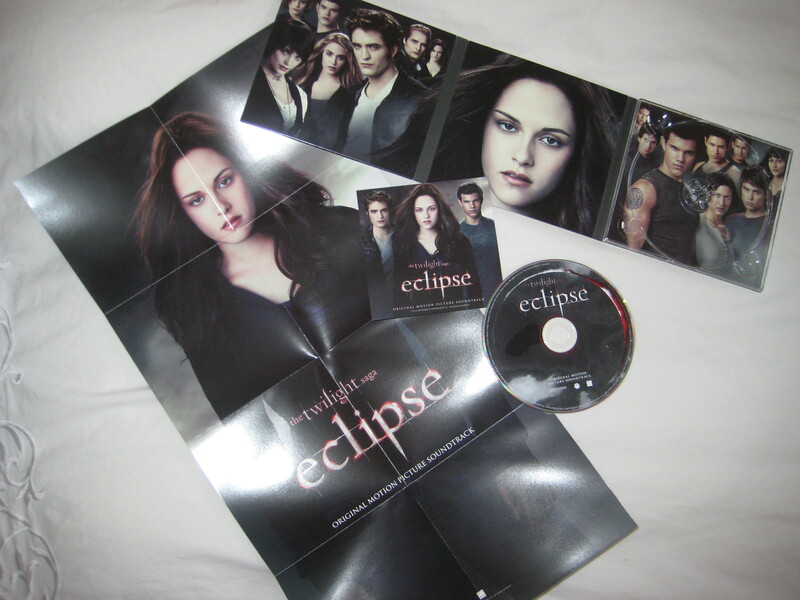 “Eclipse (All Yours)” is supposed to represent Bella‘s point of view throughout the course of the film. Emily Haines smooth voice is the perfect accompaniment to Bella’s thoughts. This song is so Bella, it just feels and sounds like the character without any further explanation needed. I bet Kristen Stewart loves this song – after all, it is her character’s musical representation for the movie, and we know she’s a Metric fan. This is definitely a KStew song as well as a Bella song. We’ve all pretty much heard this song a billion times since its release as a single a few weeks ago, but it’s still great to hear it again as part of an entire compilation for the Eclipse soundtrack. This song pretty much sums up the whole feel of Eclipse for me: a story about everlasting love that must first overcome difficulty and the trials and tribulations that life throws in the way. Muse has infused this song with a power-ballad feel that is made even more evocative with the piano chords and electric guitar keeping pace with the lyrics. For me, this song mostly resonates with the latter half of Eclipse – everything to do with the battle. So far this is my favourite song on the Eclipse soundtrack. I’m a big fan of The Bravery, mostly their older stuff, but this song proves they are back. They have such an original sound that you don’t even know what to do with it in terms of categorizing. Indie/pop/rock I guess? This song is so Edward and Bella. It’s all about what they would do for one another, how time is theirs and theirs alone when they’re together. “Ours” captures that magical relationship between them that is so hard to define otherwise. This is a bit of a darker song on the Eclipse soundtrack. The storyline of Eclipse definitely takes some darker turns. This song to me captures the relationship between Jacob and Bella. The love between them is a heavy weight that neither of them can ignore. It’s a heavily emotional song that resonates with the characters and their complex situation in Eclipse. “Heavy In Your Arms” kind of reminds me of the New Moon soundtrack and the angst that came with many of those songs as an almost tangible feeling. Sia’s voice is so emotionally loaded, that the simple strings and piano in the background are all that’s needed to accompany her lyrics on this song. “My Love” is so sad and beautiful at the same time. It makes me think of a dream sequence or something ethereal and almost unreal. Once again, I think this is another song that fits in well with the emotional tone of Eclipse in terms of love and just how much strength comes attached to that concept in this story. This is the first song on the Eclipse soundtrack to offer a more folk rock sound. It’s lighter, a littler less emotionally loaded, and an easy song to listen to. This song should definitely accompany some of the lighter moments in the Eclipse movie. It seems to fit the light and carefree feel of those moments when all seems right in the world of vampires and werewolves, even if just for a moment. This song by The Black Keys offers a really different, unexpected sound for the Eclipse soundtrack. The song doesn’t immediately make me think of Eclipse or any of the characters, so I’m interested to see where it fits in within Eclipse the movie. The lyrics of this song by The Dead Weather definitely connect with the storyline and theme of Eclipse. The opening lyrics say it all – with subtle references made to the conflict between the werewolves and the vampires. It’s a territorial song, about history, and about the impact that one group has on the other. It really grasps the complicated dynamics between the vamps and wolves that Stephenie Meyer worked hard to develop in The Twilight Saga. This really resonates with Eclipse as a story because Bella finds herself in the middle of these two groups while struggling to identify and bond with both. Love love love this song – my second favourite on the Eclipse soundtrack so far aside from The Bravery. The bass in this song combined with the echoing, haunting lyrics make it so irresistable. I think this is an Edward and Bella song for sure. It’s such a good song to escape into, and I think that fits well with the two of them. Amidst the chaos that surrounds them, they can find moments of peace and escape by getting lost together. Listening to the lyrics more closely though, I’m thinking this could be a song for the epic tent scene, hmmmm. Definitely a big fan of this song! I’m not the biggest fan of Vampire Weekend. I like their music but am not really blown away by it. Some songs I like, others are a bit hit and miss. I think that sometimes you just love the sound that a band creates and constantly infuses their music with, and for me they aren’t really one of those bands. “Jonathan Low” is an okay song, once again not sure where this will fit in on the Eclipse soundtrack so will have to wait and see. I’m sure that guy in the band that likes Kristen is stoked to be on the soundtrack though! This song immediately hits you with an eerie sound that is very “Twilight” if that makes any sense. I like this song because just when you think it’s all going to be dark and edgy, it transitions into a lighter and more energetic sound, and then back again. This is a cool song – I can’t really define it, or keep up with it. I like that it sounds like nothing else. The pace and sound of this song makes me think of the Volturi, or Victoria, or maybe the wolves and the vamps preparing for battle towards the end of Eclipse. This is another darker addition to the Eclipse soundtrack. It feels like a song that is leading up to something – maybe the battle at the end of Eclipse. My next best guess would be Victoria – this song feels like something that would accompany her. The title also evoked her character traits (super speedy), so that’s kind of a clue there. I’m obsessed with Band of Horses right now. I got into them a few years ago, but their newer music (especially every song off ‘Infinite Arms’) is blowing me away. This new song for Eclipse is no exception. It’s got their hauntingly beautiful sound as usual, but once again offers up something different to listen to. This is another song to parallel the themes of Eclipse – the darker ones that is. Because of the danger that Victoria poses, and her imminent return, I think this is a Bella song. It expresses what we’re told she feels and it just sounds like a Bella song. Her character is so quiet but strong at the same time and this song feels like that. My third favourite song on the Eclipse soundtrack after The Bravery and Beck & Bat For Lashes. This song just makes me smile. The harmonies and the lyrics are undeniably catchy. “What Part Of Forever” feels like a happy love song. This song just makes me smile. It’s also another one of those songs that just “feels” like a Twilight song. I wonder if anyone is understanding what I’m rambling on about. Anyway, this is a cool song. I love it. Beautiful melody that carries the weight of Jacob‘s pain in Eclipse. The poor guy has so much to deal with. I love that Jacob always tries to do the right thing while still staying true to his heart. This song really captures that essence of Jacob – this good and honest guy who has so much to give. This song has a really unconventional melody, it’s eerie and unexpected. I don’t know if I’m a huge fan of this sound but it could definitely fit in well with the darker moments of Eclipse. I would say this song belongs with some action sequences for sure. The first thing I think of when I think of the title is Jacob and how he sleeps for ages after running patrols. This song reminds me of the wolf pack and how they back each other up. They take turns making sure everyone is safe, and they’re there for each other. This song also just feels like a Jacob song. I think it fits well with the wolf pack. My overall verdict on the Eclipse soundtrack? It’s amazing. There’s a little bit of everything, and much more. We’ve got Kristen favourites on there such as Band of Horses and Bat for Lashes, and some awesome unexpected new songs from artists that are lesser known. It’s a great soundtrack and I cannot wait to see where these songs will fit in the Eclipse movie. Thanks for reading! Eclipse Soundtrack Listing: From Kristen Stewart’s iPod Playlist? As of this morning at 10:30am, MySpaceMusic has been releasing the track listing for The Twilight Saga: Eclipse soundtrack. Individual track information has been released periodically throughout the day, no doubt to generate hype and pre-order sales for the highly anticipated Eclipse soundtrack. 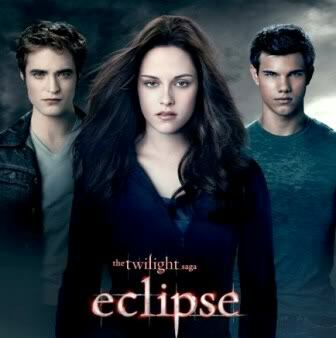 With June 30th looming in the not-so-distant future, many Twilight fans will want to know the Eclipse soundtrack in and out before they see the film hit the big screen this summer. Once the Eclipse soundtrack details started to pop up online and on MySpaceMusic’s twitter, @MySpaceMusic, the first thing I thought was: ok this is blatantly off of KStew’s iPod. When I hear Metric, Bat for Lashes, and Band of Horses I can’t help but think of Kristen and her favourite music. So the question on KStew and Twilight fans’ minds today is – did Kristen Stewart compile this Eclipse soundtrack? Because it really does look like it. Don’t forget that Kristen had her say on the original Twilight soundtrack with the Iron & Wine song – Flightless Bird, American Mouth. There was a song already in place for the prom scene at the end of Twilight and Kristen suggested the Iron & Wine song instead. Low and behold, it made its way into the movie and onto the Twilight soundtrack. Maybe Kristen threw her two cents into the mix for the Eclipse soundtrack or maybe it’s pure coincidence, but this track listing will be a welcome addition for KStew fans playlists either way. This is the order the songs were announced in via @MySpaceMusic but that order may be different for the actual Eclipse soundtrack. All of the songs are original and new material by the above bands and artists written for the Eclipse soundtrack. This soundtrack looks simply amazing upon first glance – I think Kristen in particular will be very happy with this selection of music for Eclipse! You can also check out amazon.ca Eclipse soundtrack pre-order information for Canadian Twilight fans. The Deluxe cd is listed at $16.99 in Canada. The track by Muse – Neutron Star Collision (Love Is Forever) will be available as a single on May 17th. The Eclipse soundtrack will be widely available for sale on June 8th, just a few weeks before the theatrical release of Eclipse in theatres on June 30th. It’s going to be an amazing summer Twilight fans! Hi, my name is Amy and I write about all things Twilight and Kristen Stewart. I live in Vancouver, graduated from the University of Victoria with a BA in English, and am currently completing a Master of Business Management degree at the University of British Columbia. I am a writer with a passion for communications and sharing ideas. I’ve worked with news agencies, e-marketing platforms, social media firms, publishing companies, and I currently write freelance. My goal is to write professionally for a media company and to share my passion for films and literature with everyone. Here at my blog you can read about Twilight, Rob, Kristen, book recs, music recs, fashion, reviews, local Twilight Saga filming in Vancouver and much more! Also head on over to my flickr page to see my set photos from New Moon and Eclipse. Everything you read here is written by myself so please feel free to comment and give me some feedback. You can find me on Twitter @theamytweets. Will Kristen Stewart Star In Wanted 2?